Family Law – Staff Attorneys and Put Something Back “pro bono” attorneys handle a variety of family law matters related to adoption, custody, divorce, name change, paternity, support and visitation. Clients may walk in for a free consultation to determine whether they qualify for free legal representation. Volunteer lawyers may handle family law cases that are not accepted by the staff attorney program; in addition, volunteer or “pro bono” attorneys are recruited and trained to serve as guardian ad litems and appear in family, juvenile, domestic violence, criminal and civil court proceedings. Veteran lawyers with decades of experience are available to guide newer volunteers throughout the process as questions and issues arise. Dade Legal Aid helps complete the Self Help Packet in certain situations. 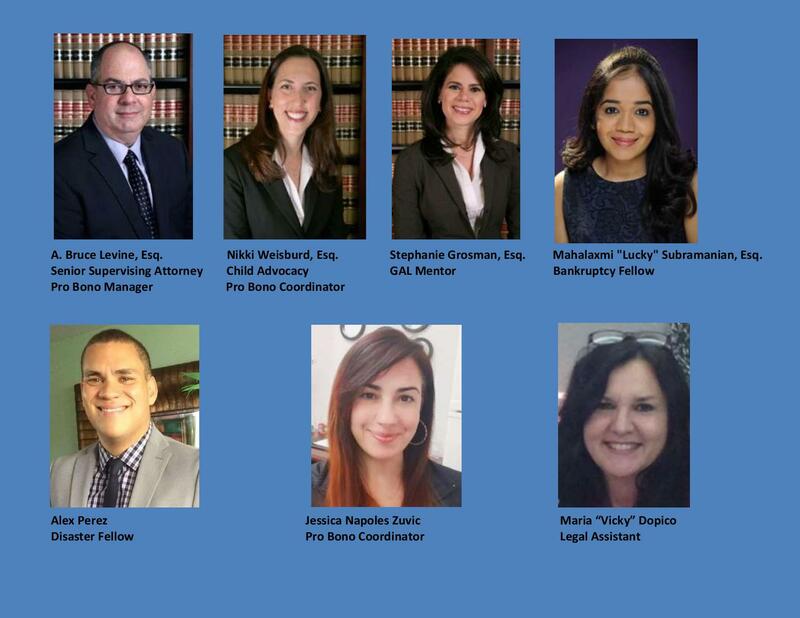 Domestic Violence – Dade Legal Aid Staff Attorneys and pro bono attorneys assist victims of domestic violence, sexual assault, stalking and human trafficking at a variety of easily accessible locations across Miami-Dade County. Visit one of our offices for free legal representation by Miami-Dade’s premier provider in filing your permanent injunction hearing. If you feel that you are in danger, call 911 immediately. You may also email us for an appointment. Volunteer attorneys assist the program by working with our team and accepting cases. Guardianship – The only provider of free legal aid to those willing to serve as guardians for elderly, physically or mentally incapacitated family members or friends, this department helps hundreds of families each year by allowing family members or close friends to become legal guardians of incapacitated and vulnerable adults. Children aging out of foster care also receive services through this department. Child Advocacy – Staff Attorneys and pro bono attorneys represent our most vulnerable citizens, foster teens, who are transitioning out of foster care into adulthood as well as victims of human trafficking by ensuring that each youth receives appropriate representation, treatment and services needed to recover and thrive. Imagine being abandoned at birth, homeless, and bouncing from foster home to foster home and falling behind in school. Our attorneys advocate for foster teens to ensure that they not only survive, but thrive as they transition into safe, secure and successful adulthood. We also assist unaccompanied minor children in need of representation and assistance. Bankruptcy & Housing –For those facing foreclosure or considering bankruptcy, we assist clients in foreclosure, housing and bankruptcy matters including protecting individuals from unlawful eviction and loss of homes. We also offer free monthly Bankruptcy pro se clinics throughout the Southern District at a variety of locations. In Miami, they are held at the C. Clyde Atkins U.S. Federal Courthouse at 301 N. Miami Avenue, Miami, Florida 33128 to provide individuals navigating the process of bankruptcy by themselves some information to try and make the road a little simpler. After being welcomed to the presentation, attendees watch a 40 minute video that explains the different types of bankruptcy as well as what to expect from the process. Following the video, attendees have an opportunity to ask questions of volunteer attorneys about issues particular to their cases. Information about the pro se clinic can be found on www.dadelegalaid.org. Educating Not-for-Profit Agencies– Non-profit groups serving low-income clients may need pro bono attorneys to handle general legal matters, incorporate, obtain tax exempt status from the IRS or serve as general counsel. We accept requests from qualifying agencies and start ups and pair them with pro bono counsel to serve as their attorney. Put Something Back (“PSB”) – The Official Pro Bono Project of the Eleventh Judicial Circuit, PSB matches thousands of pre-screened income eligible clients with pro bono attorneys and has been recognized annually by the entire Board of County Commissioners for stalwart services to the entire community. PSB pro bono attorneys gain recognition from their peers and are highly regarded in the legal community by participating in the program. Pro bono resources are critical to helping low-income individuals and families in need. To be eligible for free services, the client’s income may not exceed 150% of the Federal Poverty Guidelines. An organization may qualify for free services if it is primarily comprised of eligible clients.